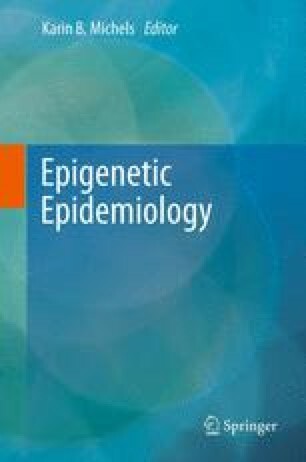 Studies in epigenetic epidemiology may identify epigenetic aberrations associated with disease, link environmental and lifestyle factors to the epigenetic profile, or unveil epigenetic mechanisms underlying statistical associations between risk factors and disease outcomes. Epidemiologic studies provide the framework for identifying epigenetic biomarkers for disease risk or early detection of disease. Appropriate design considerations for studies in epigenetic epidemiology are imperative for their success. The tissue specificity of epigenetic marks represents a challenge in epigenetic epidemiology, and identification of disease markers in easily accessible surrogate tissues are essential for large-scale population-based studies. Nested case-control studies using biospecimens collected prior to onset of disease provide appropriate data to identify epigenetic changes preceding disease. Selecting a representative study population with sufficiently large sample size and appropriate comparison group is crucial for the validity and reproducibility of the results. Challenges in epigenetic epidemiology studies include confounding and effect modification, and identifying epigenetic marks with sufficient systematic interindividual variation.